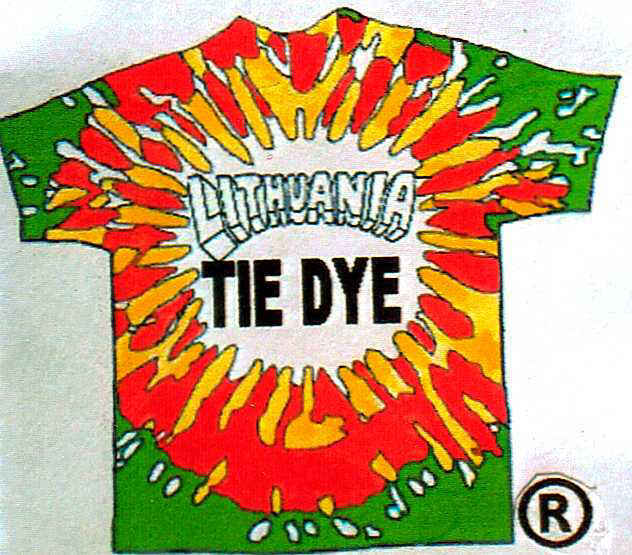 Lithuania Tie Dye® is a federally registered trademark of Greg Speirs. Original Lithuanian Slam Dunking Skeleton® is a federally registered trademark created and owned by artist Greg Speirs. Use is strictly prohibited without expressed written permission from the owner. Warning regarding use in advertising, news commentary and news reporting: Federal trademark statute 15USC1125 protects the mark "Lithuanian Slam Dunking Skeleton" and "Lithuania Tie Dye" from reports suggesting any other origin or designation of source other than the artist. Original Lithuanian Slam Dunking Skeleton is TRADEMARK AND COPYRIGHT PROPERTY OF GREG SPEIRS. Skullman™ Lithuanian Tie Dye® T-shirts Brand. ALL RIGHTS RESERVED. PROPERTIES ARE THE EXCLUSIVE RIGHT OF THE LICENSOR: Greg Speirs. SKULLMAN™, LITHUANIAN SLAM DUNKING SKELETON ®, LITHUANIA TIE DYE ® ARE REGISTERED TRADEMARKS of Greg Speirs. 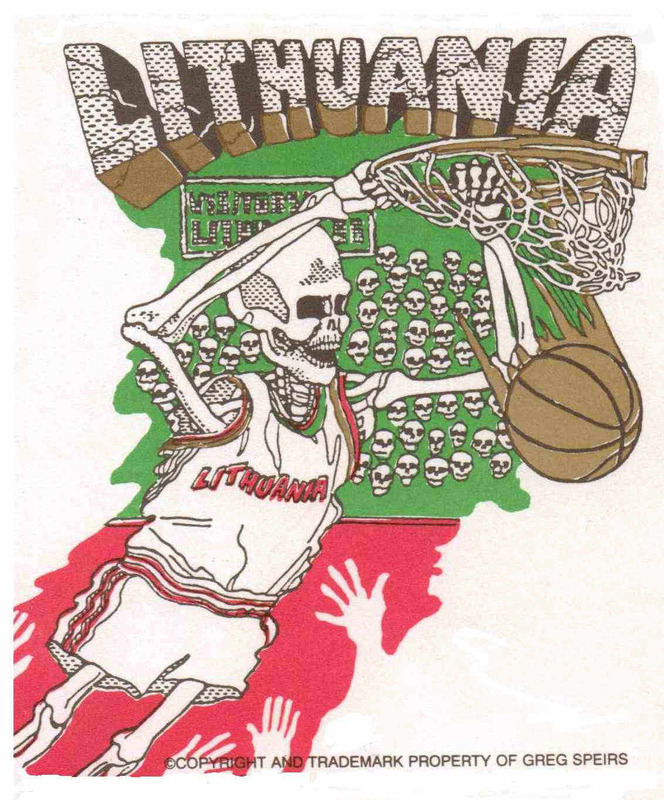 The Original Lithuanian basketball T-Shirt design was created independently by New York artist Greg Speirs. The Original Lithuanian tie dyed uniforms first appeared in the 1992 Barcelona summer Olympics and featured Speirs' original Lithuanian slam-dunking skeleton "Skullman™". Through the artist's generosity, merchandising of his Lithuania basketball uniforms design, raised MAJOR FUNDS of over $400,000.00 for the Lithuanian basketball team and Lithuanian children's charities during the Olympics and became his trademark brand. The artist's design caused nothing less than a sensation at the 1992 Olympics when it was unveiled to the world worn by the Lithuanian Olympic basketball team, at the Olympic closing medal ceremonies. Speirs donated 100% of his profits to the team and Lithuanian children's charities. (The original Skullman™ Slam Dunking Skeleton). Copyrights and trademarks are the exclusive property of the artist. All images and use of the brands must be licensed from the artist. All infringers may be prosecuted for unauthorized use of intellectual property. IMAGES ARE ALSO PROTECTED BY COMMON LAW TRADEMARK AND THE LANHAM ACT FOUND IN TITLE 15 AND BY TRADE NAME AND UNFAIR COMPETITION PROTECTION. Photos are available for editorial use only. (Editors may also link and use site photos). Source credits must appear on all images for editorial use including any electronic transmissions of the art. NOTE: Warning. The images depicted on the shirt are federally protected properties of the licensor Greg Speirs. Use to display is granted only by permission from the licensor and with proper credit attached. Copyright and trademark 1992 to 2012. We give notice to the public and media that the artist is owner of the copyright and trademark to the image, which includes any connections to, displays or links to it. The artwork image is a federally protected intellectual property. Our interest is in insuring that proper accreditation is always given in the media to the artist when his property is referred to or used. We ask that our intellectual property rights be respected or risk infringement legal action. Speirs is not a licensee but in fact is the Licensor and owner of the property.